Citation Information: J Clin Invest. 1999;103(9):1223-1225. https://doi.org/10.1172/JCI6952. Complexity of the CD28/CD152–B7-1/B7-2 T-cell costimulatory pathway. After antigenic stimulation (delivery of signal one through the T-cell receptor; not shown here), CD28, expressed on resting T cells, interacts with B7-2, and later with B7-1, both expressed on APCs. This results in transduction of a positive costimulatory signal to the T cell, culminating in cytokine production, clonal expansion, and prevention of anergy and cell death, thus promoting cell survival. Activated T cells then express CTLA4, a molecule that is highly homologous to CD28 but upon interaction with B7-1/B7-2 delivers a negative signal to the T cell, resulting in inhibition of cytokine production and cell cycle progression arrest, thus physiologically terminating immune responses. 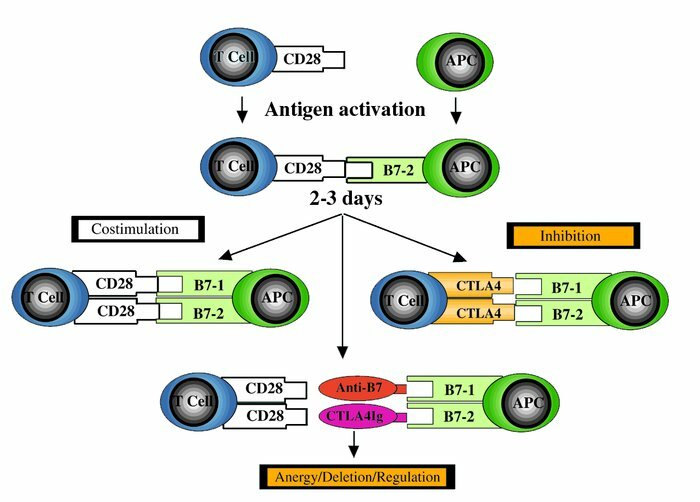 The use of biologic agents, such as anti-B7 monoclonal antibodies or CTLA4Ig, to block B7 binding to CD28 results in T-cell anergy in vitro, and in anergy, deletion, or induction of regulatory T cells in vivo (4).